Content sharing by local television newsrooms also occurs across markets. Stations in different markets that are owned or operated by the same company share content regularly, both on air and online, and these collaborations have exploded in the past two years thanks to the pace of consolidation and new technology. News sharing across station groups plays out in a number of different ways. In some cases, it gives stations the opportunity to air stories produced by a nearby station on a topic that affects local viewers. It can also bolster coverage of state government by stations outside the capital, or give newsrooms a leg up when a big story breaks in a market where they have a sister station. A potential down side to groupwide sharing is that smaller stations may have to rely on stories from larger stations in the group to fill their newscasts, instead of being given more resources to cover news in their own markets. 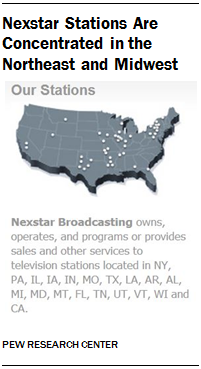 Broadcast groups that own stations in state capitals provide government coverage to stations they own or operate in that state. 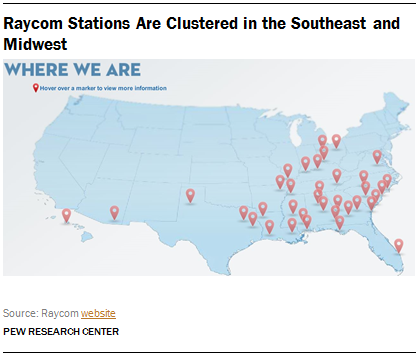 Raycom has reporters on staff at its stations in Montgomery, Ala.; Baton Rouge, La. ; Columbia, S.C.; and Jackson, Miss., for example, who file stories from their capitals for multiple stations across their states. “That’s not something that a network or CNN or an AP partner is able to do to the level we think we should do,” said Raycom’s Schuler. New technologies have made sharing content among stations faster and easier. NBC and Nexstar stations, among others, use a third-party provider to transfer high-definition video in a fraction of the time it would take to send via FTP, or file transfer protocol, which is used to transfer files between computers on a network.61 Producers can watch a real-time preview of a story before deciding whether to download it. “We can shoot something, post it, download it and get it on the air within 15 minutes,” said Walsh. Mobile newsgathering technology has enabled stations to share news as it happens with other stations in their group for a fraction of what it used to cost. Cellular connections can either supplement or replace expensive satellite and microwave trucks.62 For example, local reporters from the Raycom station in Birmingham, Ala., were able to go live during a bomb scare at the airport using a smartphone app. Their coverage was made available live to all Raycom stations through a shared server. “Never had to power up a live truck, never had to buy a satellite shot,” said Schuler.